Eduard Pié Palomar's winemaking techniques are out there. Here in the Baix Penedès along Spain's Catalan coast, he uses local varieties from single vineyards, fermenting all his wines with wild yeast in terra cotta amphorae. Some amphorae are sunk in the ground between vineyard rows, where they spend the winter under rain, snow and grazing sheep. "It's a romantic concept," says the fresh-faced, 29-year-old winemaker, who calls his vineyard-made wines "liquid terroir." Similar "romantic concepts" often make something called vinegar. Here's the amazing thing about Pié Palomar: In these raw circumstances, he makes limpid, pristine wines with none of the oxidation, funk, murk or abundance of volatile acidity you might expect. "I am very strict with the wines I sell under my brand," he says. Pié Palomar works in and around his hometown of Bonastre, a sleepy village perched in the Bonastre mountain massif about three miles inland from the Mediterranean coast and an hour southwest of Barcelona. Now in the seventh vintage of his wine label Sicus Terrers Mediterranis, Pié Palomar is recognized as a top young talent of Penedès. Most of his 1,250-case production is sold in Catalonia, including chic gastronomic restaurants in Barcelona. Some finds its way to the United States. I spent an afternoon in Bonastre trying to understand how, working solo in a rustic environment, he is able to make such fine, mineral-intense, lively wines, including white, red, rosé and a delicate traditional-method sparkler. The answer is obsessiveness. Pié Palomar sweats pretty much every detail right down to the amphorae he uses and how he seals them. He carefully guards against oxidation of his wines by using small amounts of sulfur at key stages. "There are wines made in amphorae that are undrinkable," says Pié Palomar. "An amphora can destroy a wine if you don't choose the right one. The world of clay is more complex than the world of wood." Pié Palomar, one of three Bonastre producers bottling their own wines, began experimenting with winemaking at 16. He worked in his family vineyards with his grandfather, who sold his wine in bulk but "didn't know what he was doing," says Pié Palomar. His father—a prosperous commercial tomato producer who Pié Palomar calls "anti-terroir"—did as most locals do and sold grapes to a local cooperative. His father planted some new vineyards with international varieties that Pié Palomar later replaced. 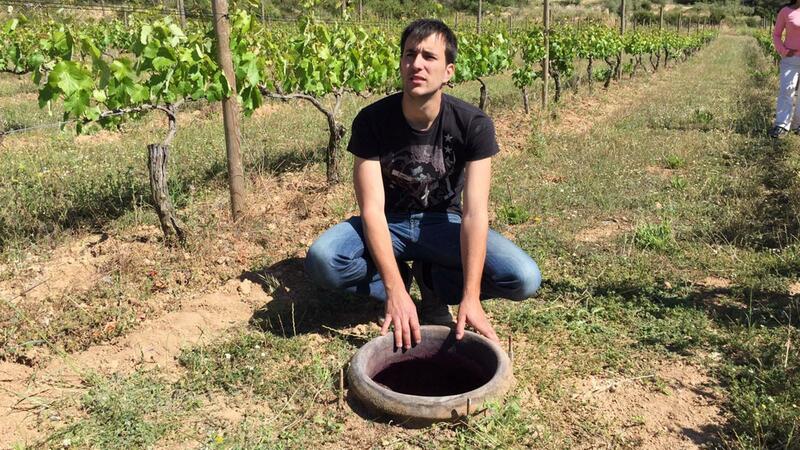 After finishing his enology, viticulture and sommelier studies, Pié Palomar spent years working for other producers, but his thoughts returned to Bonastre, with its clay limestone soils, constant sea breezes and abandoned hillside terraces that he hopes to one day restore "when I have the money." "I felt there was a big potential here that wasn't being exploited," he says. In 2009, Pié Palomar made about 330 cases of traditional sparkling wine from white Xarel-lo, a traditional grape used to make cava. He aged the wine in bottle for years, releasing the first batch of that 2009 vintage only in 2014. Working in his family's old cellar, he began using amphorae for his fermentations in 2011. The following year he started experimenting with fermentations in the vineyard for two wines, one white Xarel-lo and one red Monastrell (Mourvèdre) under the label Sicus Sons. The initial idea was for the grapes to ferment only with wild yeasts from the vineyard, not those in the winery. Also, he adds, "the wines breathe in the same soils in which they were grown, with the same vibrations." During harvest for Sicus Sons, Pié Palomar drops manually destemmed grapes directly into buried 200-liter clay vessels, which he seals with iron lids and silicone caulk. The wine must macerates and ferments—four days for white and 20 days for red. Then he presses on site with the help of a generator and electric pump, and returns the wine to amphora until spring. Pié Palomar now cultivates 18 acres of family-owned and rented vineyards and has gradually added wines to his lineup. By the end of this year, he will have 10 wines on the market ranging in price from about $12 to $45 in Spanish wine shops. (In the U.S. his red Sicus Monastrell sells for three times the $15 Spanish price at $45). Sometimes experiments don't work out. About 10 percent of his wine never makes it to bottle. With his rejected batches, he sometimes makes vinegar. The rest, he says, he recycles an old-fashioned way. "I give it to my grandfather," he laughs. "He drinks everything."